I was extremely lucky to spot the most excellent Delphic on tour at Electrowerkx in London and equally lucky to snare a photo pass for the gig. 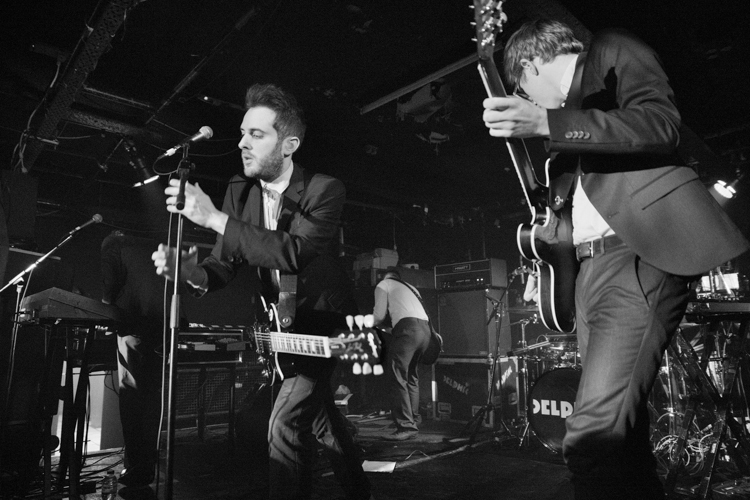 I’d seen Delphic some time ago, maybe 2oo8 supporting Orbital at Brixton Academy and kept my eye on them since. The first album, Acolyte is superb and should certainly be invested in. I’ve been waiting for the second to be released since then. The evening was nothing short of superb. I’ve been to a lot of gigs, a few bands of which turned out to be pretty big in the end. I have Andy Wilson to thank for taking me to see Blur in Aldershot touring ‘Shes’ So High‘ for instance. I felt the same this evening. If Delphic had been born earlier I would liken them to World of Twist or The Paris Angels, certainly the latter and I wish them more mainstream success than both of these under rated Madchester era outfits. The set was a mix of the old and new, the crowd responding well to both. The band are polished, older songs belted out with conviction. The evening kicked off with the new tune Baiya and finished off with favourites Acolyte and Counterpoint from the previous album. I’m excited about the second album release next month and expecting a full tour as the band work there way up the ladder and deservedly so.